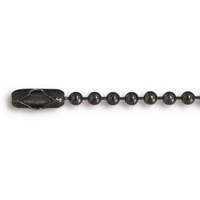 Our Ball Chains are finished with a connector, making it easy to start your own rugged or rustic jewelry design. The ball chain necklaces are famous for dog tag and military style necklaces. 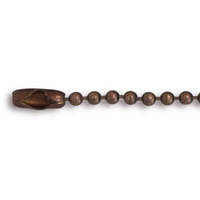 Each chain is finished with an antiqued plating, enhancing the visual appeal of each necklace. Get started making your own jewelry today with our Finished Ball Chain. Click here to see all of our Ball Chain.